1. Painting sports history. 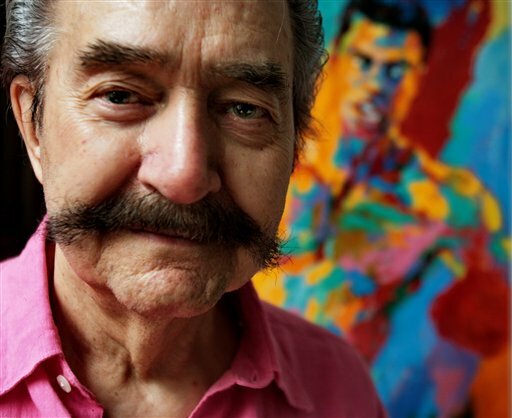 LeRoy Neiman, famous for his paintings of sports action and portraits of athletes, died Wednesday at age 91. His link to the military — according to his New York Times obituary, Neiman served in the Army during World War II as a cook in the European theater. His link to military sports comes here: A painting of the final play of the 1946 Army-Navy game entitled “Defending Victory — 1946.” Click that link for more on the painting itself, which was commissioned as part of the rivalry’s centennial celebration. Quick history: Army stopped Navy on the last play of the game to preserve a 21-18 win, an unbeaten season and a third straight national championship. It was the same year Army tied Notre Dame 0-0 in one of many contests that would go down as “The Game of the Century.” It was the last game of Glenn Davis’ Army career; the three-time All-American recounts it here. Navy fans who’d rather not dwell on an Army victory might prefer this Neiman work. 2. Former Marine fights tonight. Dustin West’s last appearance in an XFC cage lasted less than 90 seconds before the former Marine turned Stoney Hale’s lights out. The fight before that didn’t even go that long. West’s knockout power earned him a 185-pound fight with fellow Strikeforce vet Joe Ray tonight in Nashville, Tenn., as part of XFC 18. It’ll air live at 10 p.m. Eastern on HDNet; tune in quick, or you might miss it. 3. Big East and BCS. As major college football moves closer to a four-team playoff, Associated Press college football guru Ralph D. Russo takes a look at the shifting landscape. The Big East, which will include Navy in 2015, is on the wrong end of that landscape, Russo says — he expects the league will get less revenue from any playoff arrangement than the other major conferences, reinforcing its slide toward second-tier status. But cheer up, Big East fans — there’s always Florida Atlantic. 4. Basketball can be played on a carrier. We get it. Frank Schwab of The (Colorado Springs, Colo.) Gazette reports organizers of the All-Military Classic, which will feature Air Force, Navy, The Citadel and Virginia Military Institute men’s hoops teams, hope to play the entire tournament on the decommissioned carrier Yorktown. The semifinals would be Nov. 10, the day after Ohio State and Marquette face off on the South Carolina-based flattop, with the finals set for Nov. 12, according ot Schwab’s report. Potential stumbling blocks include TV deals, costs related to an extra day on the road and invading Russian hockey players. 5. Fan Fest. Navy football fans can block off Aug. 4 on the calendar for Fan Fest at Navy-Marine Corps Memorial Stadium, which includes autograph signings and a variety of family-friendly events. Admission is free, but you’ll have to pay to park. Get all the details here. 6. Teaching the elite. It won’t just be athletes representing the military at the London Olympics — some of the coaches will come from the ranks. Watch the video below and learn a little bit about two soldiers — Sgt. 1st Class David Bartlett and Staff Sgt. Charles Leverette — charged with getting the best performances out of America’s gold medal hopefuls.